Spring looks to be sticking around for this week, with mild temperatures and sun predicted — if not a full-on heatwave. Just know there might be a little drizzle tonight into tomorrow. Whether you consider yourself an optimist or not will decide whether you believe this is just a "Spring of Deception" (as depicted in this meme sequence, following "Fool's Spring, which we had two weeks ago) or Actual Spring, but for now SFist is going with the latter. Because we really want it to be true, and it might be this time. It's been a long, wet winter, you guys! Pat yourselves on the back for getting through it. As ABC 7's forecast shows us, this is mostly a week of good weather news and full or partial sun, with the warmest days in the city looking to be Wednesday, Thursday, and Saturday. (Though Saturday is forecast to be breezy.) Highs are going to hit around 68 on the Bay, which could mean it feels like 70-72 in the Mission and Potrero Hill. 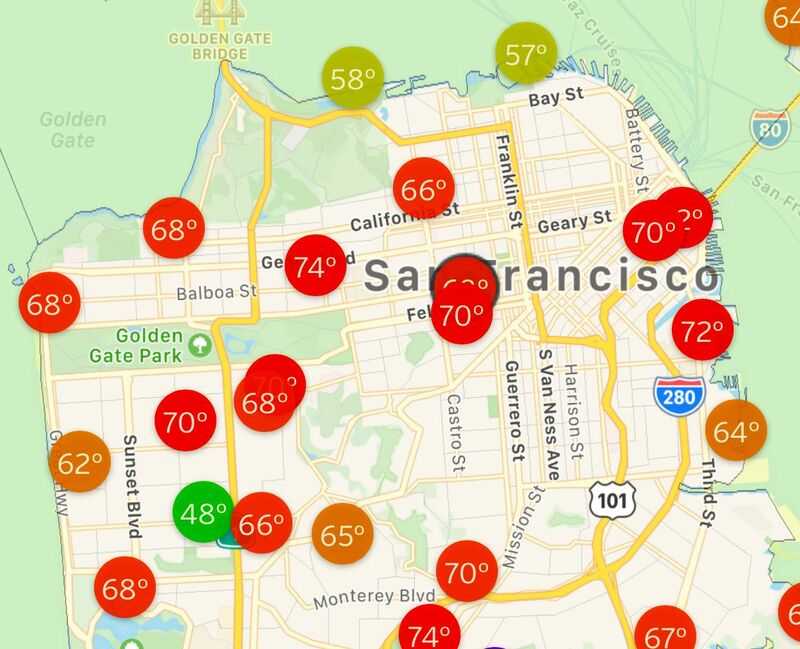 It's mostly muggy and cloudy right now, but temperatures around town are hitting 70 degrees already, including one reading in the Outer Richmond on Weather Underground. Tonight, though, a fast-moving cold front is going to bring some possible showers across the Bay Area, which will extend into Tuesday morning. Those showers have a 30 to 40 percent chance of hitting SF between 7 p.m. and 10 p.m. Monday evening, per Weather Underground, with a 10 percent chance of showers through the a.m.
Expect the coming week to be full of promising park afternoons and evenings, though, and if the wind stays in check it might even be pretty nice at the beach. If this pattern holds into next week, we might be able to call this Actual Spring ahead of what we're going to call "pre-Summer" in May, when hopefully we get a few legit hot days before June gloom arrives. Joe Murphy and Joe Robertson's play The Jungle, which had its West Coast premiere last week at The Curran, is a stirring and unique theatrical experience, one which ought to serve as a paradigm for documentary-style storytelling. The Raiders had a low-key transactional week, though, they made quite a few moves that fell mostly under the radar.